The Lindenwood large co-ed team poses with the national championship trophy. Photo taken from Lindenwood Cheer's Twitter account. 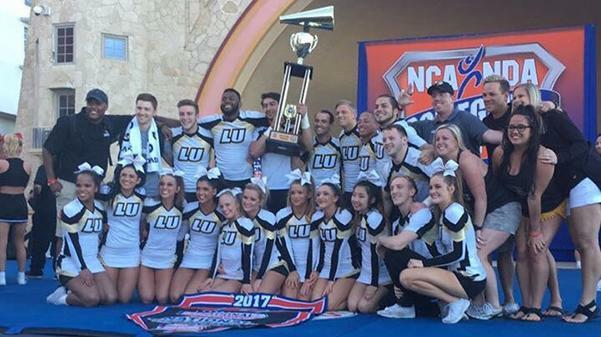 For the second time in three years, the Lindenwood large coed cheer squad has earned a national championship. “It’s such an amazing feeling,” freshman Skyler Hale said. The Collegiate Cheer and Dance Championships took place this past weekend in Daytona, Florida. The large coed squad was able to go through both days of competition without receiving any deductions, which is a first in program history. The squad finished with an overall score 95.80, which is a program record. Grand Valley State, the second place team, finished with a score of 95.57. One of the things that made the championships so special for the squad was the fact that the only routines they completed deduction-free all year came when it mattered the most. “Showcase, prelims and finals were the only routines we hit all year,” senior Travis Williams said. He said that being able to hit their routine at the nationals showcase was a relief for the entire squad, and that it built up their confidence before competing at the highest level. Although the season ended on the highest of notes for the large coed squad, the season did not come without its fair share of obstacles. Early on in the year, the team had multiple people quit or succumb to injuries, stunting the cohesion of the squad as a whole. That is part of what makes this so special for those that remained. “The people who were on the mat this past weekend really were the ones who wanted it the most,” Hale said. After going through that early adversity, the squad slowly began to come together. Prior to nationals, head cheer coach Carrie Nichols said that the had started to gel toward the end of the year, and that they had what it took to achieve their ultimate goal. “They have really proven why they are on the team, and how they are doing so well,” Nichols said prior to nationals. Although the squad has won in the past, Williams said that this one meant a little bit more to him personally.